Paris, France and Waldwick, N.J. / June 8, 2017 — U.S. aerospace and defense companies competing for military, commercial and space business in Europe and around the world will exhibit a wide range of innovative technologies, equipment and services to buyers and influencers attending the Paris Air Show, June 19 through 25 at the city’s famed Le Bourget Airport. The biennial event, the world’s largest and most diversified global aerospace business gathering, is expected to draw more than 150,000 trade visitors and as many as 2,300 exhibitors from more than 40 countries. Chief among them, the United States will present 350-plus exhibitors, the largest international contingent outside of France. The centerpiece of the American national effort is the new 4,200-plus sqm USA Partnership Pavilion, organized by Kallman Worldwide, Inc., in coordination with numerous government agencies, including the departments of Commerce, Defense and State. The 2017 show is Kallman’s 12th consecutive edition organizing Americans at Paris, its first under the new “Partnership” banner, which President and CEO Tom Kallman says, reflects a global trend. Located prominently in Hall 3, the Pavilion is a full-service business destination: an efficient location for buyers to meet more U.S. suppliers, an on-site operations center for American exhibitors to maximize their exposure and impact at the show, and an exciting networking hub for all to share ideas and insights. The 240-plus exhibitors in the Pavilion represent 32 states, including these 19 state pavilions showcasing multiple state-based exhibitors: Alabama, Connecticut, Idaho, Illinois, Indiana, Kansas, Louisiana, Michigan, Mississippi, Missouri, New Jersey, New York, North Carolina, Ohio, Oklahoma, South Carolina, Texas, Virginia and Washington. More than 60 percent of Pavilion exhibitors are SMEs; 78 are first-time Pavilion exhibitors. All are working to initiate or strengthen international partnerships that will generate new business and create more jobs back home, either by growing exports and/or by recruiting overseas partners to establish or participate in U.S.-based operations. In addition to space on site, USA Partnership Pavilion exhibitors are featured in Kallman’s online Paris Air Show Visitor Zone at kallman.com/PAS-17. The Visitor Zone features a centerpiece searchable Pavilion directory, plus interactive tools to help trade visitors plan ahead (and follow up), and to connect interested industry professionals around the world to the show, even if they can’t go. The FORUM, is a new a presentation stage area (H3, Booth 3-D98) that will feature a week-long series of thought-leadership presentations about market opportunities, supply chain advantages and workforce strategies. Special guests include Apollo 15 Command Module Pilot and STEM advocate, Col. Al Worden, USAF-Ret. Click here for the latest schedule. The theme of the Pavilion is “Celebrating a Century of French & American Partnership.” The message recognizes the past successes and future possibilities of this exceptional bilateral relationship. The theme will be inaugurated by representatives of the French and American Aerospace Industries Associations — GIFAS and AIA — to open the FORUM on Tuesday, June 20, and commemorated in a souvenir booklet produced by Kallman, AIA and GIFAS. The Newsstand, an on-site information center located near the front of the Meeting Point Exhibitors Lounge features a live, scrolling display of real-time show and market headlines on a centerpiece flat-screen monitor, flanked by take-away publications from the industry’s top publishers, including show daily media. 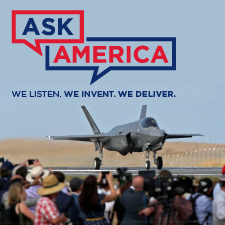 In addition to these “conversation starters,” Kallman will promote exhibitors with its “Ask America” on-site advocacy campaign at Le Bourget. The message will be placed prominently around the USA Partnership Pavilion, integrated into hospitality and VIP events during the show, advertised in show daily publications and highlighted in social media (follow on Twitter @kallmanEWC). “The United States is the biggest international exhibitor at the Paris Air Show because it’s the world's biggest aerospace and defense industry supplier, but that’s no guarantee buyers will look to work with American companies over others,” said Kallman. “As the organizer of the USA Partnership Pavilion, we have a responsibility to advocate not only for our exhibitors, but for our nation in this highly competitive global marketplace. Idaho Governor C.L. “Butch” Otter and 11 Idaho aerospace companies including Western Aircraft, Unitech Composites, Tamarack Aerospace, and Black Sage Technologies will showcase the state’s vast aerospace and technological capabilities. Idaho is uniquely positioned to play a significant role in research, development, manufacturing and testing of aviation-related products. Idaho’s aerospace industry has grown by nearly 40% over the last 20 years thanks to businesses spanning aircraft operations, maintenance, parts manufacturing, and aircraft assembly. As the largest independent testing company in the global aerospace sector, Element provides a comprehensive range of materials testing and product qualification solutions. Recent investments to grow its European platform include the acquisition of TEAMS, with a focus on production and R&D testing of composite materials; acquisition of GLP, with a focus in metals and weld testing and the opening of a state-of-the art, Nadcap accredited, Centre of Excellence for materials testing in Sheffield. Ascent introduces an innovative, turn-key, automated fuselage assembly system of tooling, machines, material handling and factory support equipment, as well as complete project integration services with professional program management. Cutting-edge robotics are coupled with proven light, flexible machines, to carry out automated drilling and fastening operations that enhance the throughput and quality of the assembly as well as the safety and ergonomics of factory personnel. Sections of fuselage shell cycle through the assembly line on mobile tooling, which significantly reduces crane moves, while Ascent’s arc-frame machines provide complete circumferential access to drill and buck rivets around the fuselage sections. Pacific Design Technologies, Inc. (PDT) is a world leader in the design and manufacture of sophisticated liquid cooling systems for commercial, defense and space applications. PDT provides both integrated and distributive systems to a myriad of advanced airborne platforms to include the 787 Dreamliner and the Mars Curiosity Rover. PDT excel in all disciplines of thermal and fluid engineering to provide unique packaging and SWAP-C benefits. Global aerospace manufacturing leader NORDAM has signed a long term contract to supply Airbus with anchored honeycomb air-inlet panels for the Leap-1A engine used on the A320neo family of aircraft. The agreement will generate several million dollars of annual revenue, with deliveries beginning early next year. Set for manufacture at the NORDAM Interiors & Structures Division in Tulsa, the air-inlet panels are comprised of graphite-honeycomb composite skins, as well as laminate profiles and fittings. The State of Texas will lead a delegation of ten small and mid-sized aerospace and aviation companies to co-exhibit as part of the USA Partnership Pavilion at the Paris Air Show 2017. Supported by the Office of the Governor staff, the Texas companies exhibiting at PAS will feature some of the state’s most innovative aerospace and aviation products and services, and highlight the benefits and the advantages of doing business in the state. Harlow is seeking a launch customer for its new HAT-05 auto throttle a light, small and economical auto throttle for business aircraft. The next evolution of the product is to reconfigure it for single-engine turboprops. Target Sectors: New Business Jets, New Turbo Prop Planes, and Upgrades to Both. Net-Inspect, a company that provides global supply chain software solutions for the Aerospace industry, recently released a new solution to help their customers assess capability of their suppliers, including sub-tiers. In June 2017, Net-Inspect released a proprietary solution to provide supply chain mapping and capability scoring for their major OEM Customers. This solution is built upon the same platform that over 7,000 aerospace companies are using to create AS/EN9102 First Articles. Using the existing platform and network of aerospace suppliers, their customers can now identify suppliers in the sub-tiers, rank suppliers based on capability, and quickly assess risk due to political or natural disaster. Protective Breathing Equipment selected for use on new EL AL 787 aircraft. The Essex PBE provides crewmembers with ocular, head and respiratory protection during emergency conditions in an aircraft cabin. It provides 270° of visibility and eliminates the need for an oral/nasal mask. The PBE holds FAA TSO-C116 and TSO-C99 approvals as well as CAA, EASA, CAAC and ANAC approvals. Recognized for their safe design, Essex PBE units are installed in the majority of U.S. airlines and a number of carriers throughout the world. Essex' build-to-print services meet customers’ requirements for components, assemblies and systems. Essex Industries has received Air Worthiness Approval from the United States Air Force for its MMOS (Mounted Medical Oxygen System). The Air Worthiness Process determines that a piece of equipment is suitable for safe and effective use within aircraft. The process involves rigorous vibration, altitude, environmental, and human factor testing in order to qualify equipment as “Safe-To-Fly.” The MMOS is designated Safe-to-Fly on the C-130, C-17, C-21, KC-10 and KC-135. "Suppliers like Essex Industries represent a critical business voice to help decision makers understand the incredible impact that the aerospace industry has on their economies, employment and communities,” said Kent Fisher, Boeing’s leader for enterprise Supplier Management. Essex Industries is proud to announce that it has received a Boeing Excellence in Advocacy Award for 2016. The Boeing Company issues the award annually to recognize suppliers who have achieved superior performance in government outreach activities to help government policymakers better understand aerospace issues and promote legislation that support aerospace companies. “Our supplier network is one of Boeing’s greatest competitive advantages when it comes to advocating for our shared interests,” said Kent Fisher. Essex Industries Marks 70 Years in Business — Stop in Missouri Booth 3/A135 for a Wine Stopper! Essex Industries was founded in 1947 by Harold and Sidney Guller in their father’s basement. The first product, an F-214 Radio Noise Filter, laid the foundation for the company’s future. Decades later, Essex manufactures a variety of Platform Controls and Aircraft Components and has been part of virtually every major military and commercial aerospace program since 1947. Stop in to say, “Happy 70th", and take away a Wine Stopper. While supplies last. Plattsburgh International Airport will undergo a $38 million expansion over the next two years. The project will transform the former military facility into a transportation and economic development hub. The construction of an air cargo receiving/distribution center and establishment of a general aviation customs facility are planned. A 60,000 sq.ft. industrial building and multi-modal facility will be added and several hangars will be renovated. This project builds on the recently completed $43 million terminal expansion. Clifford-Jacobs Forging is hosting a demonstration of a technology that promises to reduce forging lead-time, improve metallurgical properties and reduce cost. Direct Forge Intensive Quenching (DFIQ) uses a high velocity, proprietary quenching process to harden forgings immediately after forging. Bio-Based, Safe, Effective, Eco-Friendly Functional Coatings are HERE!! Protection from chemical weapons attacks! WMDtox[TM] coating detoxifies nerve weapons (Sarin, Russian Vx, and more) on contact! Over the past 13 years, Reactive Surfaces has become a well-recognized leader in the development of bio-based functional coatings that provide long-term, effective solutions to real world problems. Our military coating, WMDtox™ detoxifies chemical weapons on contact, is safe and non-caustic, and can be used on all types of military equipment, including airplanes, tanks, electronics, uniforms and weaponry. Coatings functionalized with our self-cleaning DeGreez™ additive can be used in electronics, eyewear, automobiles and kitchens. Innegra Technologies founded in 2011 has quickly made an impact on markets from sporting goods to automotive, medical, military, and now aerospace. A material that offers tremendous energy dissipation, extreme toughness, the ability to reduce or stop fracture propagation, tough enough to contain blasts, and provide excellent dielectric properties, all at a very low weight, makes it a much needed product for a multitude of applications. Smith Bearing are manufactured to meet FAA and OEM specifications. Cam follower and track roller bearings made from stainless steel are the latest trend in the aircraft industry. Smith Bearing has been a leader in the design and testing for this style product. These bearings are used in the wings, doors and various other applications for aircraft. Our engineering department will recommend the appropriate bearing for your application. Novaria Group Completes Purchase of Space-Lok, Inc.
Novaria Group has acquired aerospace leader Space-Lok, Inc. Space-Lok focuses on the design, development and manufacture of high quality internally and externally threaded fasteners and component mechanisms for the aerospace industry. This acquisition expands the suite of proprietary and qualified products Novaria can offer customers while simultaneously enhancing ongoing opportunities for future growth. Space-Lok’s capabilities include CNC machining, hot/cold forging, thread-rolling, gun-drilling, grinding, EDM machining, tapping and tool making covering the full range of aerospace materials. Machinists Inc. provides ISO 9001 certified metal fabrication, welding, CNC Machining, finishing and assembly. The Paris Air Show is natural for Machinists Inc. considering their extensive experience in the aerospace industry. Their aerospace tooling team includes experts in electro-hydraulics, programmable logic controls and motion control analysis for each project’s unique tolerance requirements. Machinists Inc. has more than 50 years of experience. We operate the largest precision machining shop in the Northwest and have the ability to react quickly to our customer’s needs. Aviation Specialties Unlimited, (ASU) Inc., will display a new product combination designed for a more rugged, lighter, comfortable mission experience with the new aviation night vision helmet mount and battery pack known as the Aeronox® along with the Aspida™ carbon Paraclete Aviation Life Support helmet with the Kairos™ Retention Assembly, and ASU night vision goggles. The Exhaust Tool works in conjunction with ThermoAnalytics’ flagship software, TAITherm. It uses a powerful, localized convection model, advanced flow pathfinding, and built-in exhaust components to deliver fast, accurate transient simulation. The convection model is tuned specifically to heat transfer coefficients for an exhaust system and built-in parts utilize specialized physics and streamline capabilities. Assess thermal management design decisions and ensure the safety and functionality of your exhaust system with ThermoAnalytics’ Exhaust Tool (www.thermoanalytics.com/products/exhaust-tool). Platinum 3.1 provides a 25-year data spectrum on the aviation, space, military electronics, naval, weapons, and power systems markets in a unique online service. Complementing this service are individual system reports, contract info, military market reports for selected countries, international contractor listings, defense and aerospace company reports, and defense budget forecasts. Results are displayed as unit and value of production bar graphs and pie charts. Select from 26 modules. Ideally suited for top-level executives. Solar Atmospheres premiered its 48-foot long vacuum furnace at the Hermitage, PA facility, successfully vacuum heat treating nickel alloy components while preserving the crucial elements of brightness and cleanliness. This furnace has the ability to apply tight pyrometric controls to ±10° F. Due to the furnace’s increased efficiency, the total cycle time for this thermal process will be reduced by two days compared to traditional furnace designs. Plymouth's extrusion mill at Hopkinsville, Kentucky announces it has received Nadcap accreditation for materials testing. By manufacturing in accordance with Nadcap approved processes, Plymouth assures its customers around the globe they are purchasing materials produced and tested to the highest standards set by the industry. The European company Pietro Rosa TBM is one of the longest standing companies in its field of expertise and as such this month celebrates 130 years in business. It’s no mean feat evolving ancient technology to meet the most demanding of today’s industrial and aerospace requirements. Its heritage is now intrinsically linked with that of New England, having acquired New England Airfoil Products, which was established in the 1940s, to better serve its US customer base. Target Sectors: OEM Aerospace Gas Turbine Components, Airfoil Manufacturers, Complex Machining, Rocket/Missile Manufacturers, Forged and Machined Structures and Guidance Fins. Orion has been recognized as The Boeing Company's Global Supplier of the Year in the Community Engagement category. This is Orion's third Supplier of the Year selection, having received Supplier of the Year designations from Boeing in 2011 in the Outside Manufacturing category, and in 2015 in the Corporate Citizenship category. Orion was one of 13 companies honored at a ceremony on April 12th, 2017, for distinguished performance in working with Boeing. The beginning of 2017 has started at a "Phast" pace. We have recently started servicing aircraft in Mexico, Colombia and Nigeria, supporting customer's needs for spare parts. Our outstanding bilingual customer service team has lead to customers receiving information in a timely manner and in their language. Located in the Aircraft Capital of the World gives us the unique opportunity to support customers from around the globe. The new site to be developed on current and newly purchased property will double from 49,000 square feet currently to 94,000 square feet, with groundbreaking by the end of 2017 and operations starting in early 2019. This represents a total estimated investment of five to seven million U.S. dollars. The new facility will house additional injection molding equipment, expanded secondary operations, in-house paint and media blasting, expanded plastics machining capabilities, and improved environmental features. Target Sectors: Aircraft Cabin Interiors, Environmental Systems, Landing Gear, Structural Plastics, Crew Rest, Flight Deck. American Standard Circuits (ASC) is a total solutions provider, manufacturing quality rigid, metal-backed, RF/Microwave, flex, and rigid-flex PCBs for the medical, automotive, industrial, defense, and aerospace markets from test and prototypes to production orders Qualifications include AS9100 Rev C, ISO 9001:2008, MIL-PRF 31032 and ITAR registration. ASC holds a number of patents for metal bonding processes. Safety is everyone’s responsibility in the air transport industry. When the transport of dangerous goods is involved, awareness of the regulations and the impact on flight safety is essential. CTS provides an interactive, flexible and cost-effective way for individuals and organizations to fulfill DGR training requirements. Delivered online and maintained in accordance with the IATA DGR. This training complies with general familiarization and function specific training requirements for all will-carry and no-carry operator staff categories. Aerospace Maintenance Solutions, LLC (AMS) has published the AMS Capabilities Brochure, which will be available free at booth B-109 at the 2017 Paris Air Show. The publication focuses on repair, overhaul, and sustainment of high-value components used on C-130, F-5, F-15, F-16, F/A-18, and UH-60 military aircraft: Countermeasures, Electrical and Electronics, Fire Controls, Flight Controls, Mechanical, Hydraulics, and Pneumatics, Gyros and, Accelerometers, Instruments, Power Generation, Power Control, and, Power Supplies, Radar, Radio. Certified to AS9110 requirements. QFORGE is a proprietary thermoplastic molding process developed by Quatro Composites. It utilizes a selection of thermoplastic resins, optimized for part performance, which are reinforced by discontinuous long fiber in a net compression molding process resulting in parts that are as strong and stiff as aluminum but 40% lighter. These parts can be painted, machined, drilled and even tapped. Detroit Engineered Products (DEP) releases "MeshWorks 8.0" for Lightweighting & Optimization. DEP is pleased to announce the release of "MeshWorks 8.0" Engineering Software to provide the best platform for: Fast Product Design, Lightweighting, Optimization, Meshing, CAD/CAE Morphing, Pre/Post Processing, Design Enablers, Process Automation, and Simulation support all in ONE product! DEP has supported 800+ Product Development projects with a focus on Weight Reduction, Durability, Safety, Reverse Engineering, and FEA/CAE/CFD Simulation Analysis and completed them up to 50% quicker than traditional processes using "MeshWorks". We have a 19-year history supporting global OEMs and Suppliers to reduce Product Development time using our advanced "award winning" platform that interfaces with all major CAD systems, FEA/CAE/CFD Meshes, and historical CAD data. Try a "no-risk" Beta project with DEP! Traverse City UAV Attorney attends 2017 Paris Air Show. Enrico Schaefer of DroneLaw.Pro will be attending the Paris Air Show. He will be speaking with international drone pilots, service providers, hardware & software developers and enthusiast interested in pursuing commercial UAV operations in the U.S.
UAV Attorney Enrico Schafer and his drone legal team of DroneLaw.Pro provide legal services to clients in the areas of drone/UAV law, UAV contracts, waivers & airspace authorizations, trademarks, patents, copyrights, domains & internet, intellectual property and complex litigation through its law firm of Traverse Legal, PLC. The clients they represent in this upcoming drone industry include Fortune 100, start-up companies, drone pilots, drone service providers and drone hardware & software developers. Blue Wolf Debuts New Patent-Pending “RDU” Remote Dimming Unit at Paris Air Show! RDU balances light output in cockpits and cabins with mix of LED and Incandescent lights. The new, patent-pending Remote Dimming Unit (RDU) by Blue Wolf eases balancing issues across mixed LED and incandescent bulb-type lighting circuits in cockpits, cabins and vehicles. Existing dimmer technology supplies mixed LED and incandescent lighting circuits with the same output voltage resulting in unbalanced light levels. This new RDU solves these problems by having a user configurable output curve for each channel resulting in balanced light output between all channels. MAS has recently invested in a state of the art HVA machine for applying laminate material to any interior panel installed on a aircraft. Our machine can be programmed to repair any sidewall panel from CRJ to 787 aircraft. HM Risk Group, a niche insurance underwriter in Austin, Texas is pleased to show its unique insurance offerings for the aerospace industry. AcroPack Series of I/O mezzanine modules and carriers for PCIe or VPX systems provide a cost-effective solution for a creating application specific customization. Acromag’s new innovative PCIe-based AcroPack Series of general purpose I/O modules for embedded computing applications are an extended version of the mPCIe specification and feature a 100-pin connector to handle the I/O. The SWaP-C (size, weight, power and cost) optimized modules are a tiny 70mm x 30mm in size and weigh on average only .05 ounces. Each module uses less than 5 watts of power and boards start at $395 per module. Mid-State Aerospace, Inc. is an authorized distributor and fabricator for Parker Hannifin/ Stratoflex Parker Division. Mid-State Aerospace, Inc. is now specializing in providing fluid conveyance requirements for landing gear hose replacement along with supporting C130 requirements. Mid-State Aerospace, Inc. has delegated TSO approval and is QPL approved. Multimedia coverage will bring the top stories from Paris to a premier defense audience all over the world. Defense News’ Digital Show Daily, a multimedia destination, will provide hourly updates of the show, including breaking news, timely analyses, on-site videos, and photos. Its print editions will also be distributed at the show. Find Defense News’ full coverage of the Paris Air Show at DefenseNews.com. On July 11, a follow-up webcast entitled, NATO Air Power, will discuss the evolving threat in Europe and how that is influencing air combat readiness during uncertain times. Export with purpose. Exhibit with confidence. Kallman Worldwide is an export marketing advocate focused on helping the United States of America and its leading businesses capitalize on international trade shows and events to grow their share of global markets. Our flagship USA Partnership Pavilion programs cover all the details of creating and presenting a professional business environment to buyers, enabling exhibitors, clients and partners to make the most of their event opportunities, cultivate meaningful global business relationships and account for a more measurable return on their export marketing investment.